Why is OFDMA a Magical Feature in the 802.11ax Standard? 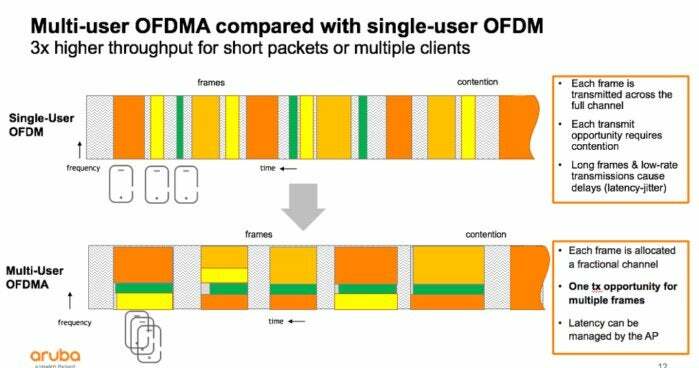 OFDMA significantly reduces contention and preamble overhead, especially for short packets prevalent in many networks. But there’s more. As we explore the new features appearing in 802.11ax, the list is unbalanced. Some would say there’s a pig in the python. One feature – OFDMA – seems much more significant than the others. First, a brief background, then a view of its implications. OFDMA (Orthogonal Frequency Division Multiple Access) is an extension of the OFDM (Orthogonal Frequency Division Multiplexing) architecture. OFDM takes an RF channel, such as the 20 MHz channel often used in Wi-Fi, and instead of using a single carrier-frequency modulated by AM, FM, or other means, sets out a number of sub-carriers. 802.11ac used 52 data-carrying sub-carriers in a 20 MHz RF channel, while 802.11ax has 234. Each sub-carrier is modulated independently and simultaneously, forming OFDM symbols separated in time by guard intervals. A transmission in OFDM is a number of simultaneous symbols on many sub-carriers. The receiver is able to track all the sub-carriers simultaneously, and demodulate the symbols independently (the ‘orthogonal’ in OFDM). OFDM is considered superior to other forms of modulation because, while it doesn’t intrinsically allow higher data rates, it is less susceptible to fading within the channel, where some frequencies are attenuated more than others by the environment. It is widely used today. OFDMA modifies a Wi-Fi characteristic – to date frames have been transmitted consecutively. A client or AP contends and, when idle, seizes the medium to transmit a frame; when it is finished, another device can seize the medium. This is a very flexible and decentralized way of controlling access; it easily accommodates bursty traffic, diverse device populations, and changing traffic patterns. But every frame is preceded by a contention period and a preamble, and as Wi-Fi progressed over the years, these remained constant in time, or even a little longer as the preamble has to be recognized by legacy devices and grew. At the same time, the payload became ever shorter as new, faster rates were added. Especially for short frames, the contention and header overhead of frame-by-frame transmissions became very large. Enter OFDMA, a technique that is quite widely used and understood. OFDMA takes the OFDM sub-carriers across the RF channel and assigns groups to transmissions between different devices. In downlink OFDMA, the AP can use different sub-carrier groups to send packets to different clients. In some ways this seems like rearranging furniture – at the end, there’s the same amount, just in different places. But OFDMA has a surprising number of advantages. Consider an example where the AP has data to send to three clients. In 802.11ac, it would contend for the medium then send three packets consecutively. With OFDMA, it combines transmissions, sending frames to all three clients simultaneously. But isn’t the time taken to transmit the data the same, given unchanging modulation levels? The difference lies in contention and preamble overhead. If, as is often the case, payloads are much shorter than the maximum packet length, then the three packets can be combined into one, with a single preamble, even though the payload may take three times as long to transmit. That’s a considerable savings. The amount of time needed to contend for the medium (even recognizing that 802.11 has reduced contention overhead over the years) is reduced, as the AP only needs one transmit opportunity. So OFDMA can significantly reduce contention and preamble overhead, especially for the short packets that are prevalent in many networks. But there are more benefits. 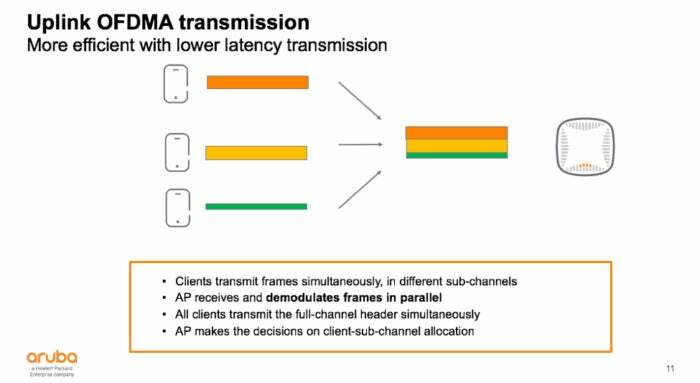 Multiplexing packets one after the other, as in 802.11ac, can increase latency and jitter, especially when legacy clients send long-duration packets at low rates: low-bandwidth traffic has to wait its turn. 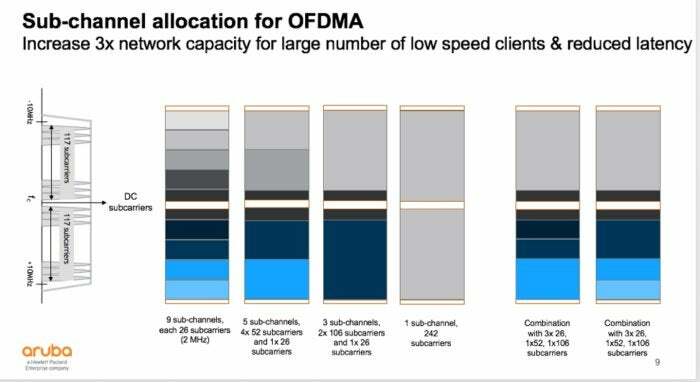 But OFDMA allows many low-bandwidth streams to transmit in parallel, reducing latency and jitter. Reduced latency is an important requirement for some IoT, video, and factory automation applications that 802.11ax can now address. With a combination of OFDMA groups and selected modulation rates, the AP can dial-in any required data-rate, error-rate, and latency for each individual client or traffic stream – for a much more sophisticated level of QoS than previously available. And OFDMA groups are not permanently assigned to traffic streams or clients -- they can be changed on a packet-by-packet basis. 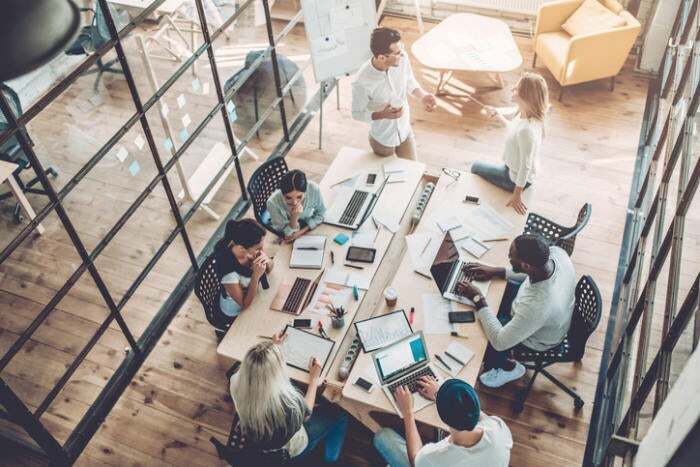 This allows a single AP to support more clients than before, meeting IoT requirements for very high-density but low data-rate device populations. OFDMA is one of the features that extends client-count in 802.11ax. Both downlink and uplink OFDMA are mandatory features for 802.11ax (although it seems likely that pre-standard equipment from some vendors will omit uplink OFDMA). They are very similar in operation: the AP grooms traffic on the downlink, transmitting to several clients in parallel. Additions to the preamble allow clients to understand which OFDMA group to listen to and demodulate. Uplink OFDMA lets each client transmit in its own OFDMA group, while the AP receives several clients in parallel. But the control for uplink OFDMA is complicated. The AP coordinates which clients will transmit in any interval, and assigns each a data-rate and transmit power. But first it must learn what clients wish to send, by requesting buffer reports. Then it sends a downlink trigger frame defining the structure of the subsequent uplink OFDMA data frame. And, for good reception, client transmissions must be tightly synchronized in time and must arrive at the AP at similar power levels, requiring sophisticated control. 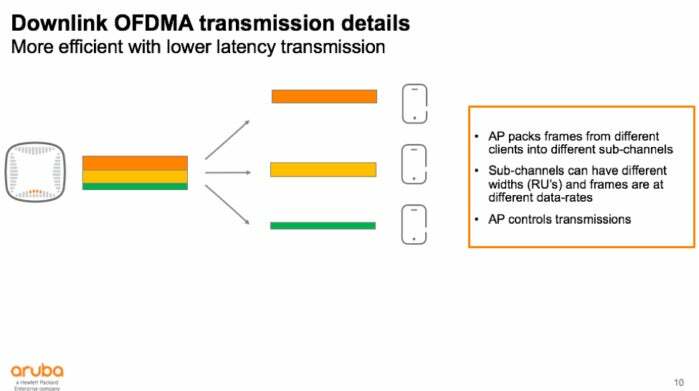 The structure of multi-user control frames in 802.11ax is too complicated to explain here – both OFDMA and multi-user MIMO are used to parallelize control traffic wherever possible, as multi-user overhead was recognized as a problem during the rollout of 802.11ac. Thus, the addition of OFDMA improves Wi-Fi in many directions. In this blog, we identified lower overhead, higher client numbers, lower latency, lower jitter and improved overall QoS. It is indeed a magical feature, and it will bring changes in AP functionality and significance in the network, subjects for another blog. When Will We Be Able to Purchase 802.11ax Access Points and Client Devices?